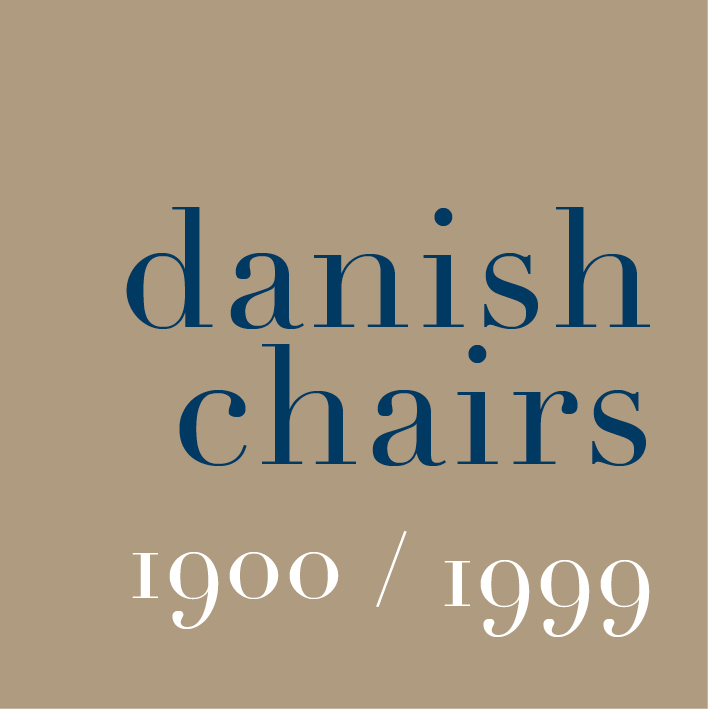 Over the last couple of months, posts have been added here for just over 60 Danish chairs from the last century with a brief assessment for each that focuses on details of form and construction and, where possible, puts the design into a wider context. A third of these chairs were designed by Hans Wegner but that reflects the number of chairs he designed and, of course, his importance as a master of innovation who, as a designer, continually pushed the boundaries for what could be done and how and why. The series was inspired by the chairs in the permanent collection of Designmuseum Danmark in Copenhagen where a new display was opened just over a year ago. A selection of the chairs is now shown in a well-lit arrangement in a dedicated gallery where the chairs are set, each in its own display case, so it is possible look at the design without distraction and, with the chairs raised up off the floor, it is possible to look closely at how the chairs are constructed and to appreciate the techniques of the carpentry - the way that the separate parts are cut, shaped and fitted together - the finish of the wood, the use of metal for parts of the chair or, with some, the whole frame, the appearance of new materials such as plywood or plastic and, in many of the chairs, the superb quality of the workmanship. This gallery at the design museum presents to the visitor a key body of research material on open access with extensive labels and information panels but in addition the museum catalogue is available on line so it is also possible to look up furniture in the collection by date, period, maker, dimensions or materials and type and the index also means that it is possible to search for information or images on other furniture by the same designer or the same maker that is not currently on display but is in the collection. It was also crucial for these recent posts here, on this web site, that last year saw the republication of the four volumes on the cabinetmakers' annual exhibitions - Dansk Mobelkunst Gennem 40 År - published by Lindhardt og Ringhof. 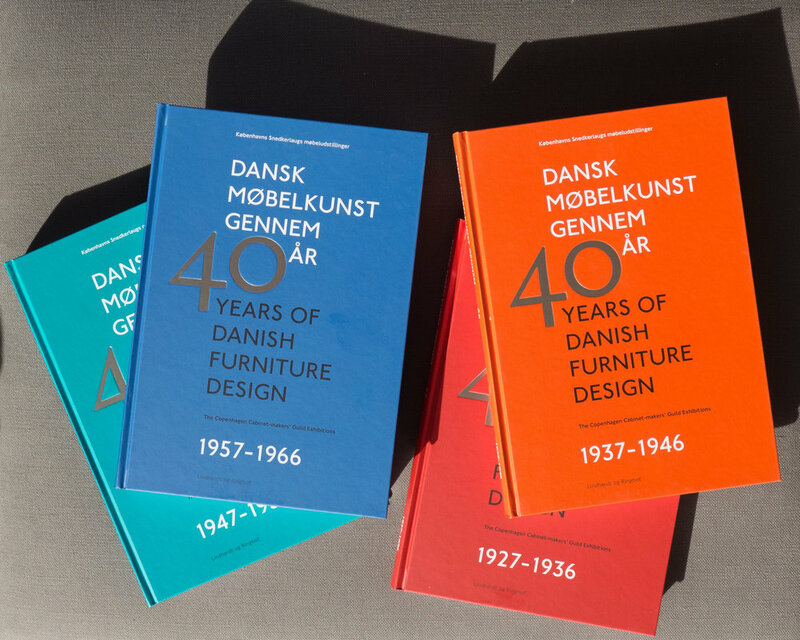 Edited by the designer Grete Jalk, these were published first in 1987 and record the exhibitions that were held in Copenhagen each year, from 1927 through to 1966, to show to the public the latest and the very best of Danish furniture. For the first decade, the exhibitions were held at a number of different venues in Copenhagen but from 1937 through to the last exhibition in 1966 all but one year, when the exhibition was at Charlottenborg, and a year at the Forum - a total of 28 exhibitions were held at the design museum - then called Kunstindustrimuseet. This was remarkable and spot lights the ongoing role of the museum in showing current design - not simply to curate the design of the past - and one reason why the present exhibition Dansk Design Nu - looking at Danish design this century - is so important. With posts here on 60 chairs, and the intention to add more, then some sort of index was necessary and arranging that by date it also works as a time line for chairs from the 20th century. At the very least, this proves that there was not a clear or straightforward linear progress through those decades so it raises interesting questions about the age of designers or at which point in their career they produced a specific chair and whether, whatever their age, they were pushing boundaries or exploring for themselves a new trend or a new material. The display of chairs in Designmuseum Danmark provides an amazing opportunity to not only look closely at the chairs but the lighting also meant that it is possible to take photographs of details. This recording of details of the joinery and the materials is more and more important as fewer and fewer people learn about timber or working with wood when they are at school and it is not an aspect of design covered in many blogs. For obvious reasons the measurements of the chairs have been given where possible. It is important to have some way of judging the scale of a design and that is rarely obvious from a photograph and particularly difficult outside the context of a room. But also, as I looked at more and more of the chairs and looked at the photographs from the cabinetmakers' annual exhibitions it was obvious that it is now difficult to understand these pieces of furniture in anything like an original setting and that becomes more difficult with time as these pieces of furniture move from being everyday objects that people have in their homes and sit on to be what are now valuable collector or museum pieces. Some of the designers and architects themselves were clearly concerned about the setting of their furniture … from the earliest exhibitions in the late 1920s the cabinetmakers used room settings and much of the furniture was aimed at a specific customer and therefore, to some extent, a known type of room … from a young couple moving into a small, new two-room apartment through to a wealthy middle-class family buying bookshelves and a desk by Klint or chairs for a large terrace or garden … so all designed with at least some idea of the space or the setting where the furniture would be used. Some designers went further. Poul Kjærholm designed with meticulous care the settings of his furniture in exhibitions and shop displays and Finn Juhl chose the colours against which his furniture was shown … producing drawings with colour wash of the room settings for the Cabinetmakers' Exhibition. This first selection has focused on key chairs of the classic period of modern Danish furniture, so with just 60 not even, at this point, all the most famous chairs but a reasonable selection of different types of chair and different materials and a range of designers. One problem is that it panders to the idea that Danish designers focus on chairs and it reinforces a general misconception that somehow the only period of great design in Denmark was that so called Classic period of the 1950s and 1960s. So the next stage for this web site will be to look at recent chairs, since the turn of the century, and present them in a similar way … looking at form and construction and context … and possibly then to look at other types of Danish furniture in the same way … so sofas and tables might be next. This should form a growing body of material with a chance to experiment with indexing and cross referencing and posts will be updated to add to entries if more information or better photographs become available or to add more links to archive drawings and historic images.